California-based photographer and teacher Nick Carver loves printing his work. As someone who uses both digital and film cameras, his printing process can vary quite a bit. In the video below, he shows his process of scanning a 6 x 17 negative and framing his work. 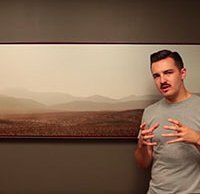 He opted to make a large six-foot wide print of his image "Desert Layers 1" which was shot on a Shen-Hao TFC-617A camera with a Nikkor-M 300mm f/9 lens exposed on Kodak Porta 160 film. For any readers who are thinking about making a large print, Nick shows his neat trick for visualizing how it'll look on a wall before committing to a certain size. He goes through his process of framing the piece as well and the final product, as you can see below, looks fantastic on his wall. It "accents" the room rather than "overpowers" it, which Carver says is what a good fine art photography print should do. Carver has more videos offering a look at his fine art photography printing process. Two of them can be seen below. To see more of his videos, check out his YouTube channel, and visit his website to view more of his work!